Use your Facebook account. If you don’t have a Facebook account, get one. Then, “like” your favorite restaurants. Restaurants frequently share Facebook only deals and coupons, so this can be a great way to save at your favorite restaurant. Sometimes, restaurants offer deals to people who “like” their page. For instance, Famous Dave’s offered a buy one get one free coupon to every new person who liked their page about a year ago. You may want to wait to like your favorite restaurant until you hear of a deal like this. Check the restaurant’s webpage. Chains don’t typically do this, but small, local restaurants may offer coupons on their website. My husband and I were planning to visit a Mexican restaurant that we hadn’t tried before, so we looked at their site first and found a coupon for 15% off our entire order. Join the e-mail list. If you opt into a restaurants e-mail list, you will often get special subscriber only coupons. They will also likely offer you a freebie for your birthday. Starbucks offers a free drink on your birthday; Famous Dave’s offers anything from a free drink to a free meal, depending on what your secret code reveals; and Stir Crazy offers a free entrée. Many, many other restaurants offer birthday freebies; in fact, some are good the entire month of your birthday, not just on your birthday. Check sites like Retailmenot.com. Retail Me Not occasionally offers coupons for restaurants. Right now they are offering a discount code for Papa John’s pizza. Subscribe to daily deal sites. There are plenty of daily deal sites from Double Take Deals to Groupon and Living Social, to name a few. Subscribe to their e-mail list, and you will get restaurant deals delivered to your e-mail every day. My husband and I have a favorite sushi restaurant that offered a $30 off coupon for the purchase price of $15. We bought the maximum number that we could purchase, and we have been using them slowly throughout the year. Check restaurant.com. 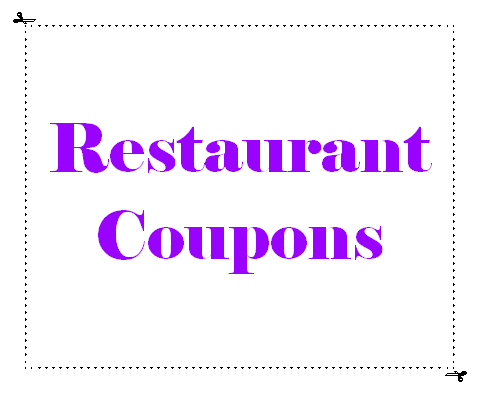 Restaurant.com typically offers coupons for many restaurants in your area, and they often offer discount codes. For instance, you may have to pay $10 for a $25 off voucher, but if you use a discount code, you could get that voucher for as little as $2 and then get $25 off! Dining out is a way of life for many Americans. If you are trying to save money, you don’t have to avoid dining out completely. Instead, dine out smarter by using online coupons to curb the amount of money you spend on your meals out.